In view of the days ahead, I felt it to be a great idea to remind us of the stories we get told as kids about our history. One of these tales is that of the Pilgrims and the Indians and how “the first Thanksgiving” was spent. Whatever the case, the tale of turkeys and “Thanks be to giving them to us” seems to have meaning in the U.S., oops. . . back then it was still an unnamed part of the New World, surrounding the hamlet of Plymouth. Several years ago I had the fortune of visiting one of the region’s most successful, big turkey farms, now gone to pieces and about to loose all of its relics from long ago, when turkeys were raised in densely packed buildings, grown from freshly laid eggs into two year old fowls, treated constantly for the risk of new contagions and vermin, thanks to the great researchers at the nearby State Farm College setting (Cornell). 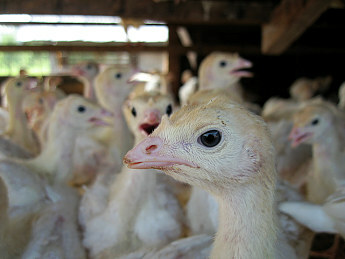 Each section of these long barns held the fowl at different stages in life; the entire series of these slides, representing the different stages in growth, appear on the page links that appear on this posting. The James Way farm was a barn that could be constructed in pieces. The invention of this new form of building construction enabled barns to be raised almost as fast as those of the Amish, but with a lot less people and neighbors. This series of pictures I took of this unique piece of farming history in Dutchess County is on a page I produced years back. The end and middle of sections where the poults were raised, at varying ages. They were moved from the heat lamps near the hatchery to the caged areas at the opposite end of the floor over a few weeks. At this opposing end, they were fed a recipe laced with Fort Orange Turkey Starter, inspected regular by a licensed vet (Dr. Crum); this was to prevent bacterial outbreaks on their skin and in their respiratory passages. As the character of farms and their content changed, so too did their cost, safety, industrialization and methods of use. This transition or change in a business over time, and its relation to changes in land use patterns and natural resource requirements, is termed SEQUENT OCCUPANCY, a study of land use developed in the 1890s by geographers. In the long run, there is not much difference in the way we raised turkeys about a century ago, and how they are raised today, except for the technology–at least in the big business setting. And yes, I am holding back on saying anything for the moment about some of the huge megabusinesses responsible for cloning and bioengineering farm crops–both plants and animals. Few of us known that the first animal patent was secured by a NY Ivy League school around 1850-1855. It was for a cow that produced huge volumes of milk. The agreement made between the US Patent Office and the university was that the university was allowed to hold the patent, but it had to allow the “product” to remain in the public domain for all of its subsequent years.